Pectoral cross - A131 (with chain) - Istok Church Supplies Corp.
A small cross of the classical form is made of brass and covered with high-quality 24K silvering. 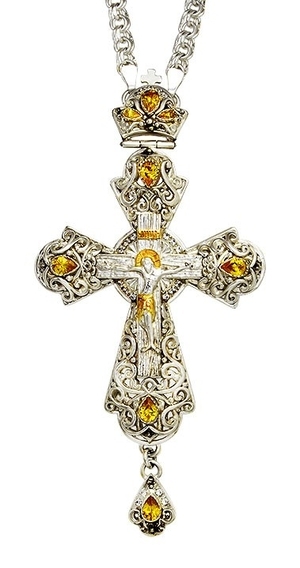 The front openwork part of the cross is made as a see-through one, the rear wall is polished to a mirror finish. The crucifix is decorated with a fragmentary gold-gilding. phianite stones of excellent quality are fixed manually, which excludes the possibility of their falling out.